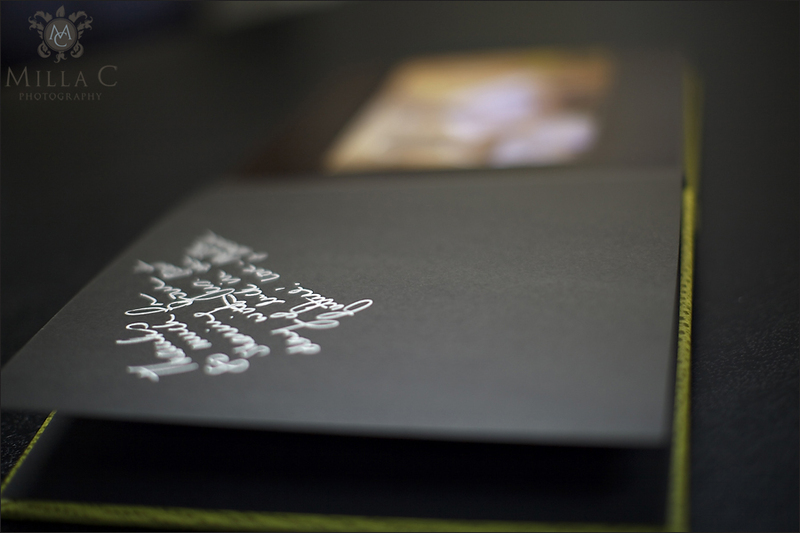 I want to show you a few photos of our guest sign-in albums for wedding receptions. These albums have become really popular since we started offering an engagement shoot with every level of wedding coverage, and it is one of my personal favorite wedding add-ons! The sign-in album is 10×10 inches with thick, hinged pages like our 12×12 wedding albums (and, they would look awesome sitting together on your coffee table!). 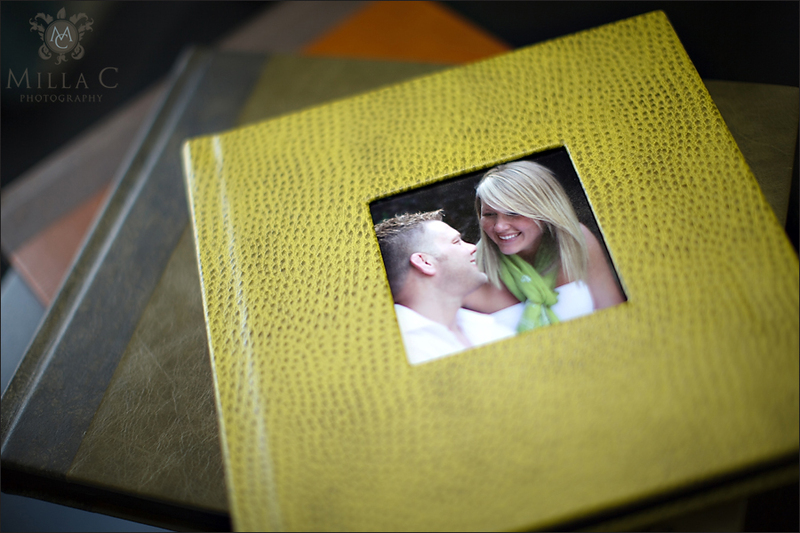 It includes your favorite engagement photos and also offers room for guest signatures on every page. The color options are modern and fun, and the album color can also coordinate with your wedding album color and/or wedding reception colors. And on a personal note, I always love to see guests enjoying your engagement photos at the wedding reception! Here are a few photos from our studio sample of Adriel and Neal’s engagement session. We have many more of these books coming in the next few months from last year’s engagement shoots. So, I will post more photos as they come in. Hi everyone! I am back today with more D.C. photos! These were a few photos we took Saturday night before dinner. It was very, very dark, and we were very, very hungry. But, we had time for a few photos, and the wonderful 50mm 1.2 barely pulled it off without a tripod! Here are some favorites from our nation’s capitol! 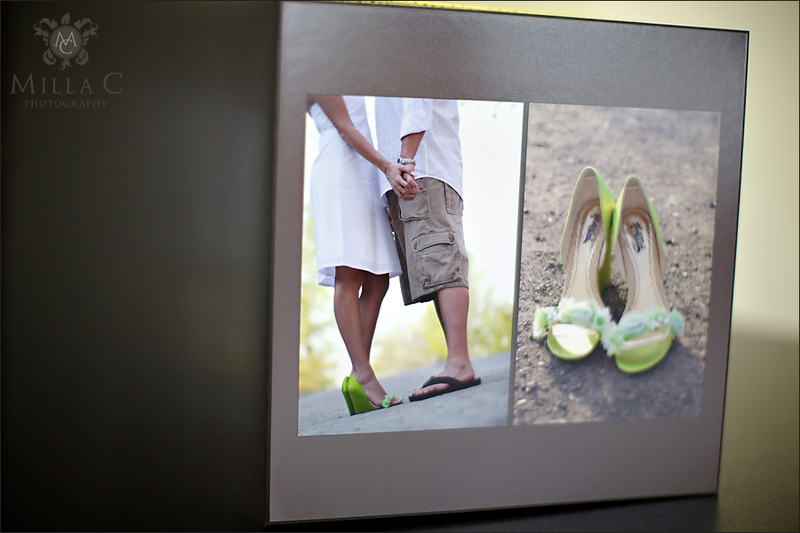 Pittsburgh Wedding Photography: The Milla C. Photography Proof Box! Recently, Brad and I have started including a full set of professional printed proofs with every wedding and portrait package. And, we just received the new Milla C. Photography proof boxes for delivering these proofs to our clients! Aren’t they awesome? I absolutely love them and can’t wait to start sending them out. Why do we include proofs with our wedding and portrait packages? First, we love having photos in-hand and we want our clients to hold actual physical photos instead of only viewing them on a computer screen. It’s hard to see the big picture of your wedding day when you’re viewing photos one-by-one on a small screen, and because of issues with monitor calibration, the photos will look slightly different on every computer screen! You can read my posts about monitor calibration here! Also, we want you to ENJOY your photos by putting them in frames, passing them out to family and friends, sticking them in thank-you cards, etc. Finally, we include professional proofs with every package because we want our clients to see the difference between professional prints and consumer prints. Seriously, folks, there is NO comparison! Our professional prints are completed with a lustre coating that protects them over time. And, the colors are bright and vibrant without being over-saturated, as they often are when ordered from consumer labs. We have rave reviews about the quality of our professional prints, and I want everyone to have some in-hand! pamela marie photography - beautiful! they look remarkably like the ones i use, too… got ’em from a company called DNL that i found last year at wppi. do you use the same company?? anyway it was great meeting you yesterday and thanks for stopping by my blog! i actually emailed you, too, but i have no idea if it made it through because a lot of email filters think i’m spam. haha! This week’s challenge at I heart faces is HANDS, and though this isn’t a close-up photo of hands, I chose this photo of the Caruso family because I love how they are using their hands to show love and affection. Very, very sweet. More to come soon of this precious little girl! This weekend Brad and I (and the dogs, of course!) had the wonderful chance to get away to Washington D.C. for fun and for work! I hadn’t been to D.C. since high school, so it was very fun to visit all the monuments and enjoy the city together. When we are on vacation, I really try not to spend all our time taking pictures. However, the sun was shining, and I just couldn’t resist playing with that sun flare a little! :) So, here are a few daytime photos of D.C. A few night photos and lots of baby photos to come soon! Love the flags and all that SUUUN! The reflecting pool in front of the Lincoln memorial wasn’t very reflect-y. Yes, that’s solid ice. People were actually brave (stupid?) enough to walk around on the ice. No, no thanks. I walk around on enough ice just getting to my car in the mornings! Pittsburgh Family Photography: The Sawyers! I want to warn you ahead of time. But, for those of you who are brave enough to keep reading, I want to show you another session from our photography workshop that I described here. This wonderful family is the Sawyers, some friends of ours who kindly volunteered to bring their kids out to play in the dirt a little so we could practice shooting energetic children in a bright lighting situation! This is what happened. So cute! Pittsburgh Family Photography: The Rhoades! Photographing children can be one of the most difficult jobs for a photographer because, unlike adults, children are always on the move and rarely want to slow down for photos. However, photographing children can also be one of the most rewarding if you’re willing to PLAY with them and capture natural, fun moments. And that’s why last November, when my uncle was in town for a mini-photography workshop, I asked for volunteers for family photo shoots to so he could practice the art of holding a session while also running around the park, playing duck-duck-goose, riding on swings, etc. We had such a wonderful response from friends who were willing to come out for photos, and I have three sessions that I haven’t posted yet because I was waiting for Christmas to be over (so I wouldn’t spoil any surprises). But, I am very excited to post them now! Without further ado… the Rhoades! Up next, the Sawyers and Koerbers! The Rhoades are some of our best friends in Pittsburgh, and when I sent an email asking for photo volunteers, Dave responded that Ali (his wife) was out of town and that he would love to surprise her with some photos of the boys! So, without further ado, the Rhoades boys! Ali - Milla – these are great and hung all over my house as you know! I love your eye for grabbing just the right minute/glance/instance. It was such a nice surprise for me! I am back today with more product photos to share. Brad and I only have a few more wedding bookings open this year, so we have been turning our marketing efforts to 2011 and thinking about additional services and products that we’d like to offer our clients in the future. We have redesigned our wedding packages and have made many great updates to our album offerings as well as product packages that include cards, framed collections, and beautiful canvas prints. And, we have added a very exciting service: the Milla C. Photo Booth (more to come on that later!)! To reflect these changes, we have created an new pricing pamphlet that we will be sending to prospective clients. Instead of sending pricing via email as we have done in the past, we will now be mailing these beautiful cards with all our pricing and package information for you to have in-hand! So, if you are interested in more information about our wedding or portrait pricing, you will see a new box on our contact form asking for your full address. Here are a few pictures of the new Milla C. Photography pricing pamphlets! After an entire day stuck inside with the snow falling outside, Brad and I couldn’t wait to get out and walk around the neighborhood a bit. It was absolutely freezing, but there is nothing like breathing that fresh, cold air. what a dork. a very cold dork. this isn’t much good now! Don’t even think about taking that parking spot! The theme of this valentine’s week at I heart faces is KISSES! So, here’s one of my favorite Mt. Washington kisses from Elyse and Boris’s wedding. What a precious moment! Happy snowed-in day everyone! Unfortunately, we had a wedding scheduled today that had to be moved to next weekend, but we figured we needed to put the cameras to use somehow! So, we went out and took some photos around Greenfield. Hope you are all tucked away safe and sound in your homes. Hopefully we’re past the worst! My dad gave our family three of the greatest gifts I can imagine. 1) He loved our mom like crazy. He hugged her in front of us. He kissed her. He told her he loved her all the time. 2) He loved us like crazy. He hugged us. He kissed us. He told us he loved us all the time. 3) He took pictures like crazy. He documented our precious childhood in photos, and I think this is one of the greatest gifts a parent can give a child. Thank you dad for loving mom like crazy, for loving us like crazy, and for taking pictures of it all. I love you like crazy. This weekend while I was in Florida, I dug around in a few of MANY boxes of pictures and found a few that I loved. Today I scanned them and had them printed larger. I just adore these photos. One of many photo shoots in our back yard. We LOVED that clowny doll. Krisan trying to run away. p.s. is she not the cutest child EVER? I love that hair. Dad coming home from work in the cougar. We hated that car and eventually made him get rid of it because we complained so much and wouldn’t ride with him. I feel awful about it now! Sitting with happy-dog. Probably for a Christmas card.